A quiet weekend lies ahead for Ballymore with just the one runner - St Ives - heading to Caulfield on Saturday. Having his first run since June, the talented chestnut has returned from his spell in good order, faring well in a couple of jump-outs. The 1400m of the Swettenham Stud Summer Championship heat (race six) may however prove too short for the son of Pentire and Michael Moroney is looking forward to seeing what he achieves this preparation. "Whatever he shows on Saturday he will improve upon," he said, "but he does seem to have come up well." To be ridden by Luke Currie, St Ives - who had only two runs during his winter Queensland campaign - has drawn well in barrier four. Our only other runner for the weekend is All Out War, another horse who will improve as he steps up in distance. Due to tackle the Pakenham Gazette Maiden Plate at Pakenham on Saturday, the imported gelding does step up from a handy first up sixth over 1400m to 1750m and Moroney is confident he will break his maiden status quickly. 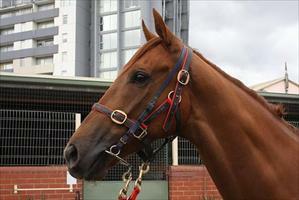 "Whether this race is long enough remains to be seen but he ia very, very nice horse," he said. Due to be ridden by Andrew Mallyon, All Out War has drawn nicely in barrier five.